In Deus Vult, players are members of a highly secretive order of the Church at the end of the 12th century, dedicated to fighting supernatural evils that would otherwise corrupt God's divine plan for humanity. From hunting ghouls and werewolves in the forests of the Holy Roman Empire, from tracking down diabolic cults in Rouen, to quests across the Holly Land for powerful relics that may save humanity, there is much work ahead of them. 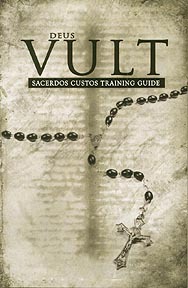 The Sacerdos Custos Training Guide contains everything a player needs to know in order to create a character, equip them with the finest weapons of the Order, and fight supernatural evils hidden within the medieval world. Requires the Legend Core Rulebook.